A jacket is an investment that I think goes a long way because it can be dressed down or up, casual or dressy, laid-back or sophisticated. And best of all, young or old, it suits everyone. If we were the same size, I could probably share with my mom or mil! I wear a lot of cover-ups like these, be it boxy jackets, boyfriend blazers or a simple cardigan, and the same question is always posed to me; tak panas ke?!! Hehe. Well obviously it’s a little bit warmer than if I wear a bikini out, but it’s not like I work at the construction site or walk 5 miles to go to work. So it’s all good. Aircond, sister, aircond! Wearing scarf from Tudung Sisters, jacket from SuriSara, heels from Kiss & Tell, all from FashionValet. Was eyeing on the same jacket at the website. Seeing u in it makes me more firm bout it. Yahoo im taking it! 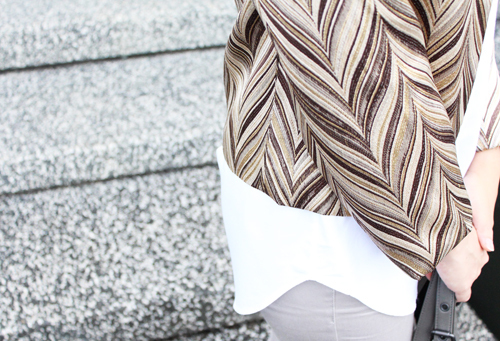 Love the layered textures. Where is this location btw? love the whole outfit here vivy! !i love wearing blazers/jackets to my class too.yup,mmg panas sikit but who cares anyway.haha! !love u vivy!!! Dear Vivy, if you don’t mind.. please make a tutorial on how you wear your tudung/shawl in this post =) love it! Air-conditioning’s getting expensive in this city now (gotta love our dear govt) – hope you’ve got thinner layers, I hear the average temp is a balmy…..25 degrees. Complimentary deodorant in shopping malls anyone? What is the bag’s name? Thinking of getting it for my mum if I can afford it. Thanks V.
Please stock for sale some thinner inner and light cotton shawls! Thanks!